NASHVILLE, Tenn. (March 4, 2016) – Iconic duo and international sensation, the Bellamy Brothers, have formed production company Hippie Cowboys as David and Howard Bellamy pursue opportunities across multiple platforms, including television, cable and digital. “We’re in hundreds of cities every year playing shows - just imagine the stories we have to share after touring the globe. Hippie Cowboys will provide a foundation for us to build some really cool projects that provide a glimpse into our crazy life on the road and at home,” David Bellamy said. Hippie Cowboys is formed in partnership with content, branding, production and distribution company BaseCamp Media + Entertainment and Harper/Abdo Productions. “BaseCamp Media + Entertainment is excited to be working with such iconic and highly regarded musicians. Howard and David have a unique family dynamic as well as continuing to influence the country music scene with their songwriting and performances. Our partnership plans to showcase both the Bellamy family life and their music in this new venture, " said Andy Sheldon, co-founder & CEO of BaseCamp Media + Entertainment, a Los Angeles-based entertainment company pioneering new forms of content creation and monetization in partnership with global brands and retailers. “This is a tremendous opportunity for us to tell the stories of these music legends, while partnering with some of the most experienced entertainment experts in the business,” said Jason Harper, Executive Producer for Harper/Abdo Productions. Co-founders Frank Abdo and Jason Harper have been part of producing such shows as “The Biggest Loser” (NBC), “Hogan Knows Best” (VH1), “The Ex & The Why” (MTV), "Spike the Strip" (SpikeTV) and “Food Tech” (History Channel). “40 Years: The Album” encompasses more than their four decades in the music business. The project is a compilation of past hits, like “Let Your Love Flow,” ”Redneck Girl” and “If I Said You Have a Beautiful Body (Would You Hold It Against Me)” and 20 new songs. Feb. 20 Neuse River Music Festival Lenoir College Student Center- Kinston, N.C.
Feb. 25 Newberry Opera House- Newberry, S.C.
March 02 Indian Creek RV Resort- Ft. Myers Beach, Fla.
April 06 Jamestown Fraternal Order Of Police Jamestown Civic Center- Jamestown, N.D.
April 07 Bismarck Rural Fire Department Bismarck Civic Center- Bismarck, N.D.
April 09 Havre Police Protective Association/ Armory-MSU- Northern- Havre, Mont. April 10 Five Valley Crime Stoppers/ University Theatre-University Of Montana- Missoula, Mont. April 12 Billings Police Protective Association/ Alterowitz Gym- Billings, Mont. April 14 Platte Valley Community Center Theatre- Saratoga, Wyo. April 15 Grizzly Rose- Denver, Colo.
April 26 ASAP Energy, Inc. Trade Show/ Pioneer Cellular Event Center- Weatherford, Okla.
May 28 Atwood Music Festival/ Atwood Water Park- Monticello, Miss. June 04 Wilson’s Steak And Seafood- Doyline, La. June 18 Mid-Coast Spring Break Bikefest Pickleheads Roadhouse- Sunrise Beach, Mont. July 15 Bluegate Theatre- Shipshewana, Ind. July 16 Bluegate Theatre- Shipshewana, Ind. July 19 Anderson Music Hall- Hiawassee, Ga.
July 22 Country Thunder USA- Twin Lakes, Wis.
Aug. 05 Gillespie Family Farms “Friends & Neighbor Celebration”- Johnson, Minn.
Aug. 06 Private- Dickinson, N.D.
Aug. 07 Rollie’s- Sauk Rapids, Minn.
Aug. 10 Umatilla County Fair Open Grass Courtyard- Hermiston, Ore.
Aug. 11 Tillamook County Fair Rodeo Arena w/ Grandstand- Tilamook, Ore.
Aug. 18 Music Ranch Montana- Livingston, Mont. Aug. 20 I-Bar Ranch / Concert Series- Gunnison, Colo.
Aug. 27 Theatre Dublin- Dublin, Ga.
Nov. 10 The Museum Club- Flagstaff, Ariz.
Nov. 11 Peppermill Concert Hall- Wendover, Nev.
Nov. 13 Hitching Post 1- Apache Junction, Ariz.
Nov. 18 Country Tonite Theater- Pigeon Forge, Tenn.
Nov. 19 A. Curtis Andrews Auction Barn- Federalsburg, Md. Nov. 26 Sugar Creek Casino / Event Center- Hinton, Okla.
Howard and David continue to prove that the trail they’ve ridden to fame has been as unique as their music itself—music that is now celebrating 40 years of success. The road that started on the pop music charts in the ‘70’s, took a winding turn into country music in the ‘80’s, paving the way for duos to come, such as Brooks & Dunn, Montgomery Gentry, Big & Rich, and The Judds. “If I Said You Had A Beautiful Body (Would You Hold It Against Me),” originally scrawled on a dinner napkin by David, rocketed them to the top of the country charts the way “Let Your Love Flow,” had done in the pop market just a few years earlier. It proved to be the first of a string of fourteen No. 1 singles in the U.S. alone. They’re the only U.S. country music act who've toured in India, Sri Lanka, New Caledonia and Qatar. 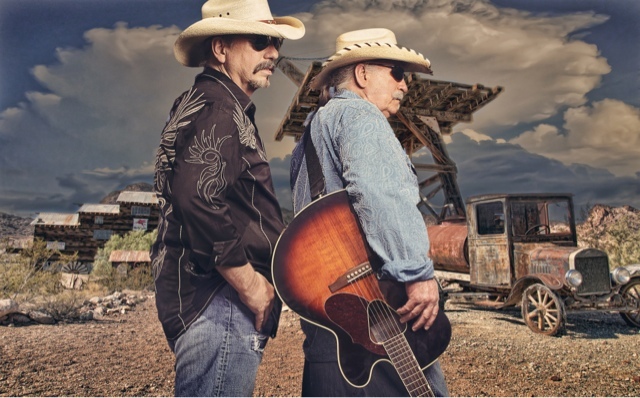 The Bellamy Brothers hold the record in both the Academy of Country Music (ACM) and the Country Music Association Awards (CMA) for the most duo nominations. Numerous Grammy nods have also been directed toward the brothers. For more information, visitbellamybrothers.com.